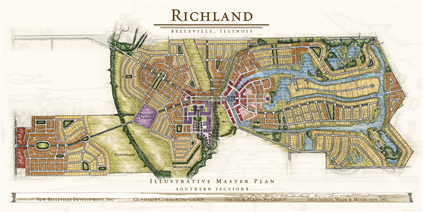 Richland/New Bellville a 1,800-acre urban center development project, located south of Belleville, Illinois. 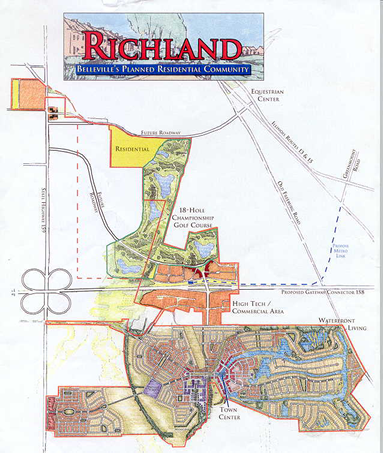 When completed, the Richland Development will include a new town center and commercial district, mixed use urban core, residential, golf course, private schools, and hiking and biking trails throughout. 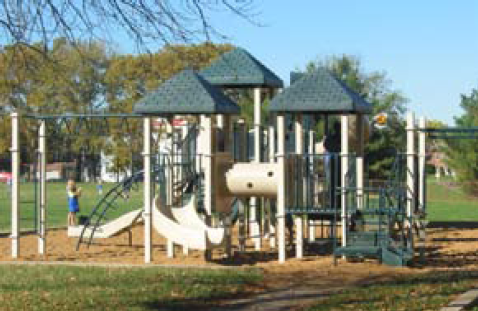 New Bellville Development, Inc. selected Intuition & Logic as the project stormwater engineer. We provided stormwater master planning, floodplain modeling for the multiple bridges over Richland and Sugar Creeks, and final design and construction documents for the many detention/retention, water quality and enclosed stormwater systems. The 250 Acre Phase I design is currently under construction and includes more than 10 wet and dry detention basins with water quality components, over 470 individual stormwater structures, and over 5 miles, 27,000 feet, of pipe. 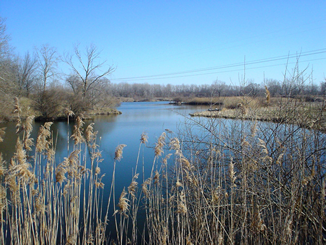 The objective of the Phase I systems is to reduce potential receiving stream erosion, flooding, and improving storm water quality. Outfall structures control the flow rate from extended detention basins to ensure a 48 hour draw down for the 1-year, or stream-forming, storm events. By controlling these frequent storm events, we are able to closely match the natural hydrologic regime, reduce stream erosion potential, and improved the water quality of runoff flows into the receiving streams. Each outfall into a receiving stream corridor includes a vegetated rock stilling basin and swale. The stilling basin will substantially slow the water velocity and dissipate energy to protect the receiving stream. Water quality is further enhanced with the use of a depressed island along the main boulevard. The street runoff is allowed to flow into the island and is captured in shallow depressions. The depressions will have under drains of porous material, such as sand or pea gravel, so that rain water can seep through this porous material to a small drain pipe, leading to the enclosed stormwater pipe system.